Green’s Tayte Carver boxes out Western’s Sheldon Richardson during the second half of Friday’s game in Franklin Furnace. Western’s Broc Jordan contests a shot from Green’s Ethan Huffman during the second half of Friday’s contest in Franklin Furnace. 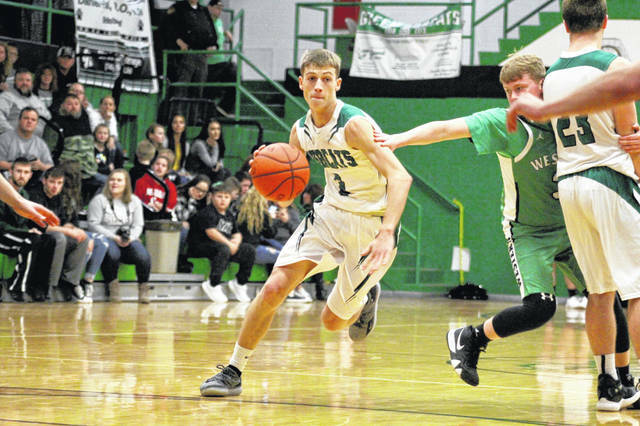 Green’s Tanner Kimbler scored a team-high 18 points in Friday’s 49-43 loss to Western. 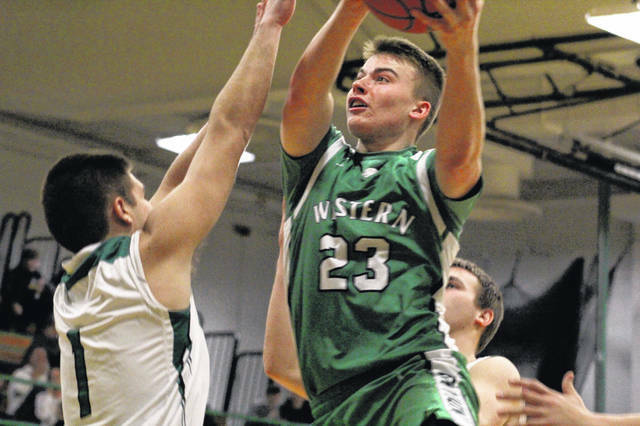 Western senior Lane Brewster scored 12 of his game-high 21 points in the fourth quarter of Friday’s 49-43 win at Green. FRANKLIN FURNACE — At crunch time Friday evening, Western’s Lane Brewster had no trouble finding his clutch gene. Heading into the fourth quarter, Brewster had accounted for nine points while watching Green cut his Indians’ 26-15 lead at halftime to just two points at 29-27. With momentum on their side, it seemed as if the Bobcats were poised to seize a lead and steal a win at home. But Brewster had seen enough of that narrative. So in effect, he wrote his own ending. Brewster scored 12 of his team’s 20 points in the fourth while hitting 8-of-8 free throws attempts. 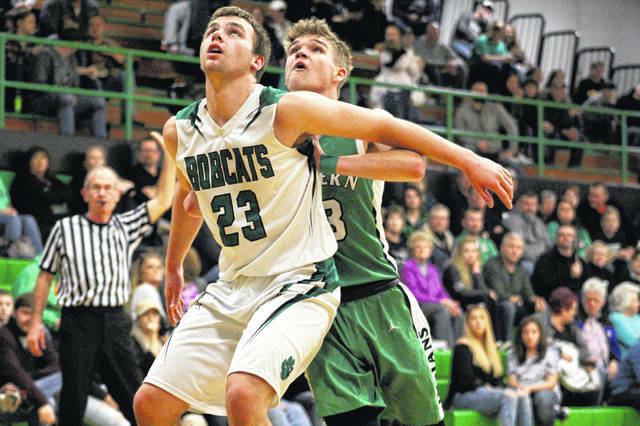 His late efforts made the difference in a 49-43 win over the Bobcats; one where Brewster’s teammates executed a defensive game plan to keep Green’s Tanner Kimbler under wraps. Kimbler still got his, making Western’s life harder than it needed to be late in the game. But through three quarters, Green’s senior leader had just nine points. In the fourth, he hit three 3-point field goals to keep the Bobcats (12-7, 6-6 SOC I) within reach. But it was too little, too late in a game where his team shot 15-of-53 from the field and 8-of-18 from the charity stripe. Western (15-4, 9-3 SOC I) seemingly couldn’t miss throughout the entirety of the first half. The Indians shot 10-of-16 from the floor in the first two quarters and were led by Brewster and a hot shooting Noah Whitt. Brewster started the scoring with 7:29 left in the first before Sheldon Richardson hit a 3, giving the Indians an 8-4 lead. That lead was stretched to 15-4 after one thanks to a pair of 3’s from Whitt. In the second, Kimbler hit his first 3 of the night with 4:53 to go, cutting the deficit to three at 19-16, but Western stretched the lead back to 11, at 26-15. The third belonged to Green. Trailing 27-18, Kimbler and Caden Blizzard led the Bobcats on a 9-0 run, forcing a 27-27 tie with 1:39 left. But Brewster proceeded to score the Indians’ next 12 points, giving his team a 39-32 lead with 2:26 left to go in the fourth. Kimbler hit two more 3’s down the stretch, coming at the 1:14 and 13.9 marks, but it wasn’t enough. Brewster finished with 21 points, leading all scorers, and added a game-high 11 rebounds. Whitt finished with eight points, Richardson and Gibson had six apiece, and Broc Jordan tallied four points and 10 rebounds on the night. Kimbler led the Bobcats with 18 points while Tayte Carver added eight. Ethan Huffman also played a significant role, scoring eight points and grabbing a team-high seven rebounds. 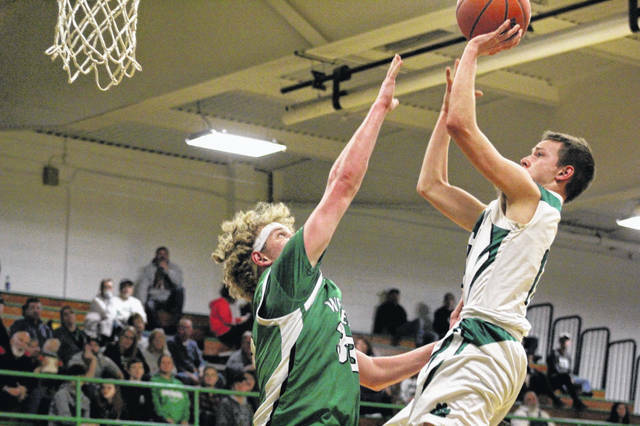 While the Indians get back to action Tuesday, hosting New Boston, Green will try and regain its momentum against Notre Dame the same evening. Western: 14-26 FG, 16-26 FT, 5-11 3pt. (Whitt 2, Richardson 2), 31 rebounds (Brewster 11), 18 turnovers, 6 assist (Brewster 2, Jordan 2). Scoring: Brewster 21, Whitt 8, Gibson 6, Richardson 6, Jordan 4, Theobald 2, Ferneau 1, Montgomery 1. Green: 15-53 FG, 8-18 FT, 5-23 3pt. (Kimbler 5), 23 rebounds (E. Huffman 7), 7 turnovers, 7 assists (E. Huffman 2, Sampson 2). Scoring: Kimbler 18, E. Huffman 8, Carver 8, Blizzard 4, Z. Huffman 3, Sampson 2.